This week everyone at Iron Craft was asked to get Lucky or at least create something around the theme of Lucky. 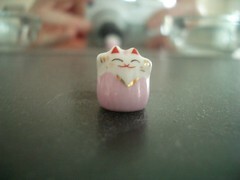 I knew right away I wanted to make based on the Japanese Lucky Cat or Maneki Neko. Now, I’m not really the superstitious type. I don’t have usually carry lucky charms, throw salt over my shoulder or other such things. But, about six years ago, my roommate gave me the little maneki neko above (he is super tiny about the size of a molar) for Christmas. She told me to carry it around & it would bring me luck in love. That summer I met my husband Matt. Coincidence or luck of the cat? I originally thought of stenciling the cat of a t-shirt or cardigan but decided I’d rather have something that wasn’t permanent on any one piece of clothing. A pin seemed the perfect answer. That way one day he can add some whimsy to a simple black sweater & the next my red peacoat. He’s embroidered on fabric for lots of texture but then treated with fabric stiffener to create a pin that holds its shape. I like the fact it’s really light so it doesn’t flop over like heavier pins can on lighter fabrics. I’m not currently asking this lucky cat for help with anything in particular but, who can’t use a little extra luck everyday? 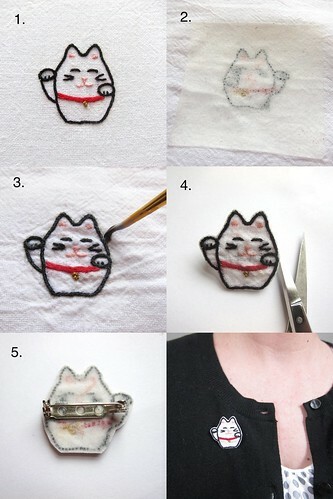 If you can do basic embroidery this is a really simple project that can be made into any shape you like. small amount of white fabric (big enough to fit in your embroidery hoop), I used a flour sack towel because it has a little texture. 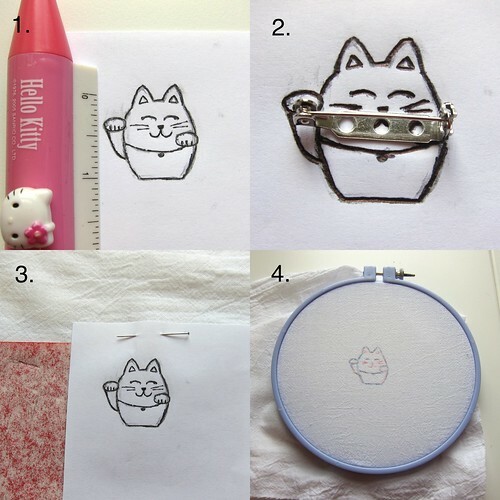 Draw your pin image on a piece of paper. I based mine on the one from this site & kept it to about 1-inch. Pin the image to your white fabric. Put a sheet of dressmakers tracing paper between the fabric & image it with the color side facing down. Draw over all the lines with a pen or stylus. I usually trace over the lines at least twice. Because my fabric was so textured I also drew over the final image with a disappearing ink pen to get a nice sharp line to follow while stitching. 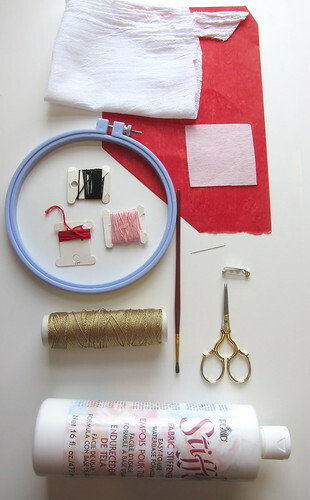 Place your image in the embroidery hoop & tighten until the fabric is taut. Stitch away. Embroider your image. I used split stitch for outlines and satin stitch to fill in the ears & nose. For the gold bell I made a French knot with metallic thread. Wet as needed to remove any of the lines from drawing the image on. Let dry. Iron the interfacing to the back of the stitched image. Paint the fabric stiffener on to the back & front of the image going about 1/8 – 1/4 inch past the edges of the stitching. Make sure to saturate the fabric. Let dry completely, mine took about 6 hours. I hung mine to dry to keep it straight. With small sharp scissors cut the image out leaving just a small amount of fabric outside of the stitching. Glue the pinback to the back of the image. Wear your pin & it may bring you luck. so cute!!! thanks for the great project tutorial. I'm working on an embroidery project for my ICC this week. Not done yet. yikes! I love it and I plan on making one very soon. Thanks for the great tutorial! I have a similar cat. I didnt know it was lucky. 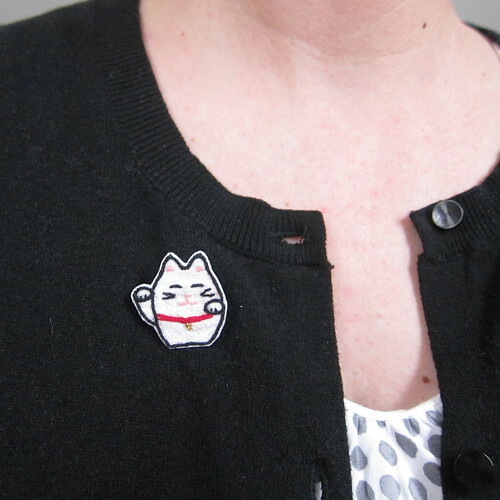 I just love your lucky cat pin- Very cute.